How Do Classic Kentucky Meals Happen? Pop Quiz! No, actually it's a Taste Test. Q: What does this . . .
. . . have to do with the next five images? A: Classic Kentucky meals come from what Kentucky's soil, land, water and farmers grow. What Kentucky grows, all manner of abundance—witness the great examples in the photos above—does not change much across centuries. So Classic Kentucky Meals, the book that's coming to a book store near you any minute now, works to make the case that Kentucky cuisine, like any cuisine, amounts to what grows around us, prepared in a nearly infinite variety of ways. The bounty in the photos above came to us on Cornbread Supper night this week, a splendid gift from the work and land of Hickory Lane Farm, near Bowling Green, Kentucky, formerly Need More Acres Farm. 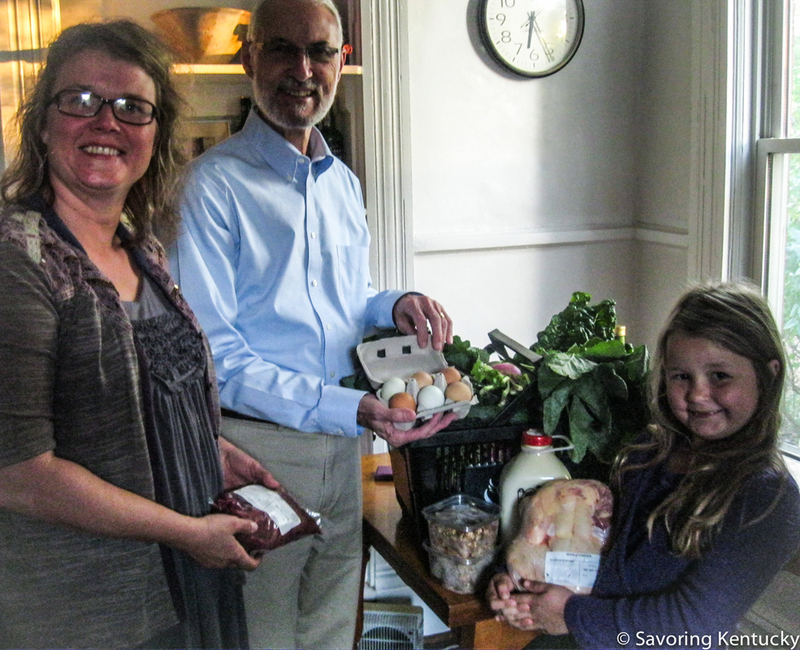 In Lexington to speak at the American Farmland Trust national conference, Michelle, left, holding the farm's chicken livers (a Campsie favorite food), and Elizabeth, right, holding a plump farm chicken, brought an astonishing array of homegrown foods from their farm to share with us downtowners. Steve, center, holds a half-dozen beautiful farm eggs, including some with the Auraucana/Ameracauna hens' pale turquoise colored shells. 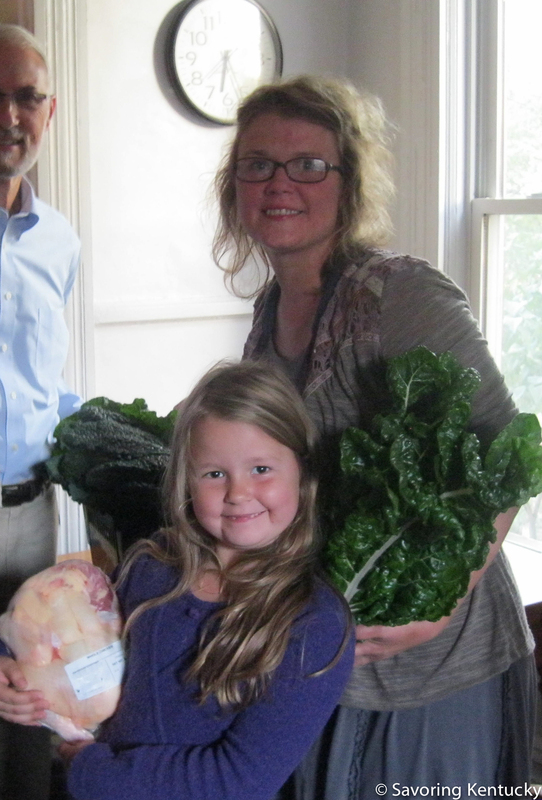 "That's about one week's CSA share from our farm," Michelle Johnson Howell said. And we said, "Wow!" I gave one thought to plunging into a cooking challenge: cook and eat nothing but these exquisite farm foods, cooked using recipes in Classic Kentucky Meals, documenting all of it on Savoring Kentucky . . . but I came to my senses quickly, as words like "book release," "research project," and "political campaign" appeared in my head. I also realized how most of these foods are long keepers. We have a week to enjoy the milk and most fragile vegetables, another week to savor the eggs and cabbage, and then we can stretch out the rest across months of roasts and stews and bakes. Double Gingerbread with Whipped Half Sour Cream? Honest truth here: I have yet to figure out and settle on a good way to publicize dates for book events associated with the November 4 release of Classic Kentucky Meals. More on that shortly. Thank you, so many of you, for asking.